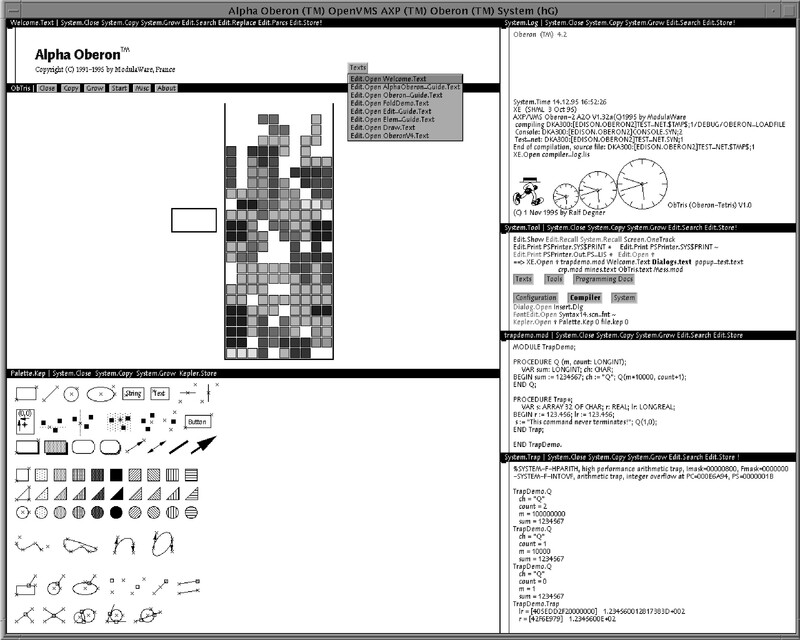 The Alpha Oberon System AOS V4.2 is the first full 64 bit Oberon System for the (DEC/Compaq) HP Alpha processor under the OpenVMS 7.1 (and later) operating system. Alpha Oberon is an extensible, integrated, graphical program development environment and application framework. Based on the object-oriented, pointer-safe programming language Oberon-2, Alpha Oberon is ideally suited for program development in industry and research and serves commercial and scientific applications as well as teaching. The dynamic linker-loader allows program execution directly after compilation. 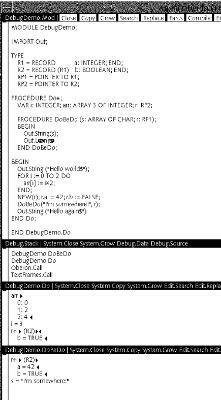 The separate 64 bit Oberon-2 compiler A2O is needed for program development under Alpha Oberon. The OpenVMS linker is only used to build stand-alone Oberon-2 programs with A2O. Alpha Oberon runs on any Compaq Alpha workstation on-top of X11/OSF/Motif or remotely via XWindow terminal connected to any Alpha server under OpenVMS Alpha V6.1 or later. With OpenVMS V7.1 or later, Alpha Oberon uses very large memory (VLM); see Digital Technical Journal. Alpha Oberon exploits the OpenVMS 64 bit P2-space not only for dynamic data, but also for global variables and program code without any 32 bit address restrictions. The 64 bit virtual address space is four billion times larger than the 32 bit address space. (monochrome) with the MineSweeper game, some texts, ClockElems, and Sisiphus. ([pseudo]color) with the Tetris game, TrapDemo.Mod, and the [pre-Ref] trap viewer result. 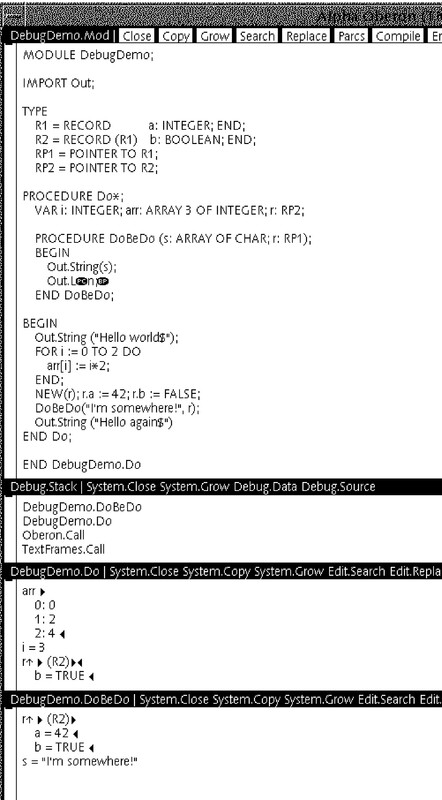 (monochrome) showing DebugDemo.Mod and a symbolic run-time debugger session. The ModulAware.com stand-alone Oberon-2 compiler A2O is a 64 bit native-code compiler for HP OpenVMS Alpha. A2O produces two different object file formats, both with 64 bit addressing capabilities, 1) for stand-alone OpenVMS linker, and 2) for Alpha Oberon System (AOS) V4. A2O was used to bootstrap AOS on the Alpha processor. All components of AOS and its bootloader are completely written in Oberon-2. Alpha Oberon was the first [and I believe it is still the only] full 64 bit implementation of Oberon System V4. Alpha Oberon is source code compatible with portable programs developed for the traditional 32 bit Oberon System V4, i.e., with ETH-Zürich's Oberon System V4, and V4 implementations further developed at, and freely available from University Linz, SSW. Alpha Oberon is binary compatible with file formats of all popular V4 text and graphics tools. AOS/A2O is not only the first [and I believe it currently (i.e. 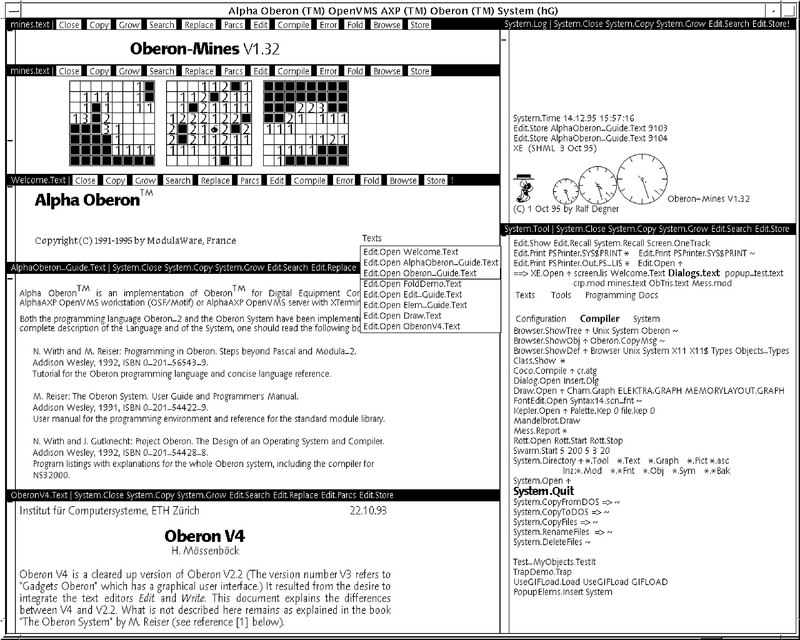 in the early 2000s) still is the only] full 64 bit Oberon System, it is also the first Oberon-2 compiler/Oberon system to implement the combination of object model and full run-time type information (Oberon System V4 from Linz did [and I believe still does] not have the former and V4 from ETH did [and still does] not have the latter). No Oberon-2 language extensions were required to support 64 bit LONGINT and 64 bit POINTER. Only two syntactic extensions were introduced, to support 64 bit integer literals and sets constructors. However, nobody is required to use these extensions, in order to exploit 64 bit computing and addressing. 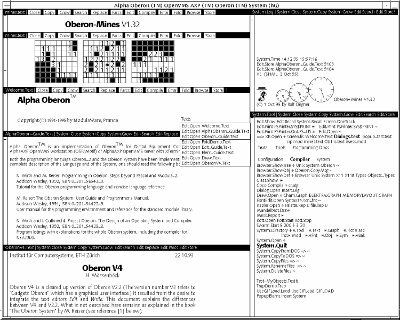 The 64 bit extensions are explained in detail in the article 64 Bit Oberon for OpenVMS Alpha (www.modulaware.com/mdlt73.htm). AOS with precompiled system and application modules is also free, but A2O, the compiler needed for program developement under AOS, is a commercial product. Without A2O, AOS can be used for example to view, modify, and create V4 text documents (using the XE exditor), to view, modify, and create graphical illustrations (for example using the Kepler graphics editor), and to play games (such as Obtris, Degner's Oberon Tetris) under OpenVMS Alpha. The Alignment Trap Oberon pages offer free download of ModulAware.com's 64 bit Oberon System Evaluation Kit for Compaq's OpenVMS Alpha. There is also a technical overview, which shows a comparison of various Oberon implementations' features. HP's 64 bit OpenVMS operating system for the HP Alpha processor is free for personal use, since 1999. (You can get an OpenVMS license on-line from the OpenVMS Hobbyist program. EmuVM (Emulation Virtual Machine)'s AlphaVM for Windows (32 and 64 bit, .NET) and Linux (64 bit); free AlphaVM-free for Windows and Linux (64 bit). Free and open-source ES40 Alpha emulator written in c++ es40.org for Windows (2000 and later) and Linux (32 and 64 bit). Project development is halted since May-2008, eventhough there are only very few errors left, mostly in floating point emulation. Migration Specialties' Avanti Alpha emulator; free FreeAXP for Windows (and maybe soon for Linux too). Copyright © (1998-2012) ModulAware.com / Last update: 28-Jun-2012.